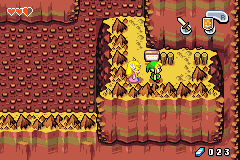 There are three hidden Fairy Fountains in total in The Minish Cap. 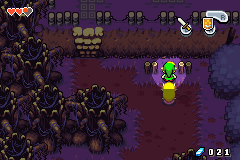 They are very useful, allowing you to increase the maximum number of rupees, bombs and arrows you can hold. To get to this fountain, you will need to have gotten the Cane of Pacci. 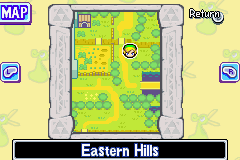 To the north east of the Eastern Hills, there is a hole you can use the Cane of Pacci on to jump up onto a ledge. 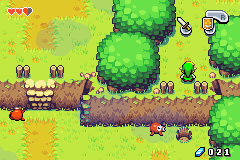 Once you are upon the ledge, simply turn right into the Minish Woods and head inside the doorway in the tree. Keep offering to throw your rupees into the water and the Fairy will reward you with a bigger wallet. 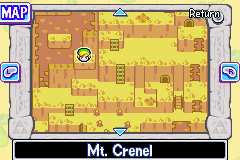 When you are climbing up the very big wall on Mount Crenel, veer to the right and you'll notice a platform with a sign on it. Bomb the rock wall in between the two posts, and another Fairy Fountain is inside. Throw a bomb into the water. The fairy will appear and ask you if you threw a gold bomb, a silver bomb, or neither. Say neither and the fairy will reward you with a bigger bomb bag, capable of holding up to 30 bombs. This one is pretty easy to find. When you enter the Royal Valley, just head down the stairs and bomb the walll between the two posts. Once you are inside and talking to the Fairy, she will ask you a few questions. There are five questions in total; answer No, No, Yes, No, No. Once the quiz is over, the Fairy will reward your vast knowledge with a bigger arrow quiver.